Christmas comes but once a year, but there are those who carry it in their hearts all year long. In Walt Disney World there are multiple locations both in the parks and also in Disney Springs where you can celebrate Christmas any day or season of the year. In the Magic Kingdom’s Ye Olde Christmas Shoppe, there are a couple of special ways that children can get into the spirit that are worth taking note of and taking the time to experience the next time you’re in the park. First up comes to young guests who are some of the earliest guests to visit the Liberty Square Christmas showcase each morning. A single tree in the shop is left undecorated at park opening, waiting for a magical moment when a child can be found who can decorate the tree as they see fit. 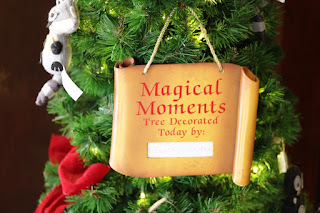 This doesn’t mean that they get to run amuck in the store and put whatever decorations that they want on the tree, but there is a fair assortment of decorations, usually those comprised of softer, less breakable materials, that they can choose from. Beyond that, the tree is theirs to decorate as they see fit. It bemuses me to look at the decorated tree, complete with Magical Moments sign, and note how most of the ornaments are clustered together in clumps all around the bottom of the tree, with the upper branches almost completely bare, save for the ornament or two that they allowed their parents to help with. Just watching the wonder and joy in children’s eyes when they’re asked, as they’re decorating, and when they stop and step back to admire their work is all the gift that most of the adults in the store need. If that doesn’t get you believing in Santa, I don’t know what will! Actually, I have another activity that just might do the trick. Tucked away in another corner of Ye Olde Christmas Shoppe is a table just tall enough for Santa’s most avid believers. On the table is an assortment of Christmas scene coloring sheets, a variety of crayons and other coloring tools, and letter templates. I can’t think of a more magical place to pen a letter to Santa, than inside the Magic Kingdom. 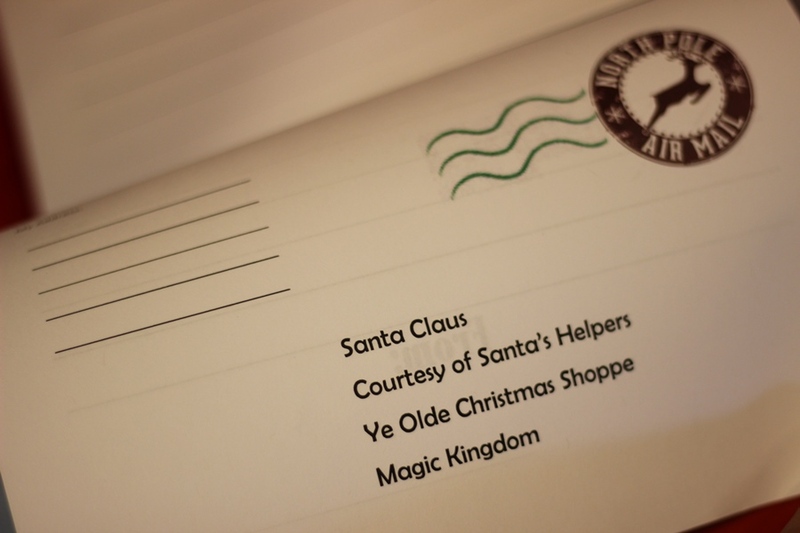 Once a child has finished their letter, and coloring sheet to Mr. Claus if they’re so inclined to provide a gift, they can bundle it up and send it along in the letter box right there on the table. That’s right, no adult help is required for a young guest to send their season’s greetings, and wish list, along to Santa. During most times of year these two activities aren’t all that highly sought after, but as the days grow shorter and the holiday mood starts to fall over us one and all, getting into the shop early enough to decorate the tree becomes harder and harder. Likewise, the letters to Santa station will get a little cramped by small artists and well-wishers. My advice to you is to get there earlier in the year, like now for Christmas in July, and capture the moment before the holiday rush. Then you can treasure ye olde Christmas memories from Ye Olde Christmas Shoppe without the hassle of the store being overrun!